At work we recently switched from Cocoapods to punic. The reasons why are irrelevant for the purpose of this post. However, one of the traits of using punic is very long build times when you’re building all your dependencies. On the plus side, builds of our project tend to be pretty quick. On the occasions that I do need to run a punic build, I often want to start working on something else while I wait. However, I also want to know the moment that the build is done, so I can continue working on our app. Thanks to a combination of a shell script, a web server, and Pushover, I can. 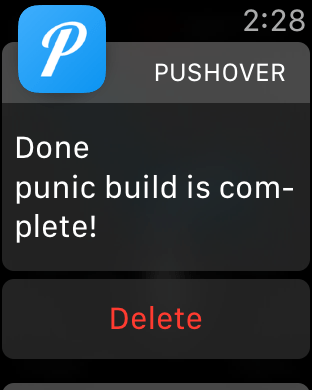 Pushover is a free service that will convert emails or API calls to push notifications to their native app. They also have an API you can use to perform a push. I have a URL that I can hit that will transform a HTTP GET with a couple parameters to a call to Pushover’s API. Here’s my code written for Node, as an example. > ~/done punic build is complete! > punic build; ~/done punic build is complete! Now I can walk away and take care of other things, but still know the moment my build is ready.